Talk about stepping outside one’s comfort zone! I haven’t passed hidden notes since junior high. The best part of course is not knowing who the recipients are and recognizing that some will crumple them up and throw them away. But maybe, someone will see it and smile, or laugh or shake his/her head while looking around to see if anyone remotely culpable is standing around. Maybe it will make someone feel good on a really bad day, or maybe it will make no difference at all. The best kindness is that which is extended with no expectation of anything in return, and given my stealthiness I am confident that I will remain unconnected to this crime of good fun. My thanks to Christine for the inspiration behind this atypical day. How fun it was to step outside myself for a little while. How intrepid and bold of me!! And if it provided a small giggle for someone today, then all the better. Perhaps as the karma truck keeps rolling along on its path, it will stop to pay the kindness forward. Not to me, but to those I love – my sons and their wives, my son and his girlfriend. Maybe the truck will make a pit stop in their respective driveways, and give them the blessings and peace and joy that they so richly deserve. Perhaps it will stop near the homeless person who plays his sax on a corner in DC, or swing by someone who is bowed under the strain of getting through the day. 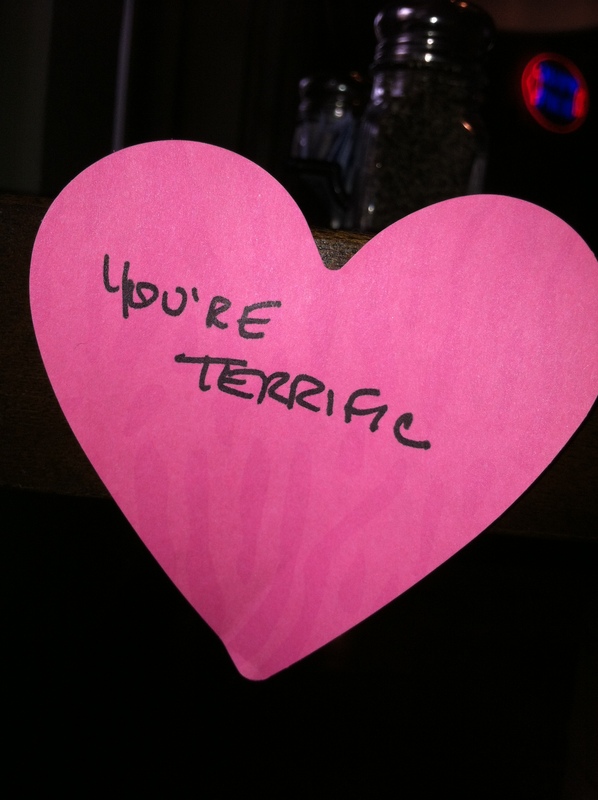 And that my friends, would be more than I could ask for – just because I ‘love-bombed’ a few unsuspecting souls today. 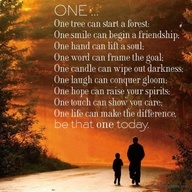 Posted on July 24, 2012 by mimijk •	This entry was posted in friendship, humor, inspiration, life lessons, love, mindfulness and tagged faith, Hope, Post-it note. Bookmark the permalink. I love that you did that! So much better than “learn to park!” on the windshield. ;). Adorable post Mimi! Thanks! It was worth doing – if only for how much fun it was to do! Such an awesome way to spread happiness. I have always heard that doing something wonderful for someone else is the best way to cheer yourself up. Great reminder Mimi! A beautifully fun and simple idea! Well done and thank you for sharing! Wow. A new look. (LOVE IT). Angel Post it notes. So, I need to ask, what happened last night to spur this on? Just felt like trying something that I would not typically do, hope a few people got a smile for free..and always believe that a lot of what you receive in this world has something to do with what you put into it…Really happy you like the new look. Something else that just happened yesterday – obviously the planets were aligned -or out of alignment depending on your point of view..
You ever cease to amaze me. Wherever you found “this”…camp out there. Lol..thanks my friend. You can visit whenever you like – it’s my little alternative universe. The password for entry is ‘hi’..
Yay! Let me know what happens!!! PS: loving the balloon theme, super cute! Thanks! Just tried out the new ‘theme’ to change things up a bit. I think I like it too! And boy, it would be far more fun to go to the gym and find an encouraging note sometimes that’s for sure! Mimi, I love that you actually did this today, hooray for you! wouldn’t be fun to watch the people’s faces as they read them? I will have to give this a try. Have a wonderful evening…it is already past your bedtime I bet.. Absolutely love this! Saw your post on my phone earlier and have been having fun thinking of you running around your town/city love-bombing everyone – of course I imagine you in a trench coat and sunglasses, being surreptitious – love that word – [but with summer temps, I think the trench would only make you stand out…oh well!] It’s got me thinking and would love to do this with my son, I know he’d love it, and what a great lesson to pass on! Thanks for making my day…Mimi the Love Bomber…and I’m on vacation, didn’t think it could get better! Yay!! It got you laughing and smiling (tho’ I think when on vacation, that should just bubble up anyway) I wanted to wear a trench coat with the collar up, sunglasses and a fedora – but I could only manage the sunglasses – it was too hot. Have fun while you’re away!! Lol – good luck and let me know if you do it!! such a great idea! just plain awesomeness! i smile just thinking about people finding them..maybe they smile…maybe they wonder ‘who’ it was intended for and shrugging their shoulders…or thinking what a cool thing and doing it themselves? wouldn’t that be great? you rock mim (and so does your love-bombing inspiration). it’s terrific and i can imagine a big sugar honey iced tea grin on your face every time you spotted a likely landing place. i know i would be and that smile would produce more and more and more….such a cool thing! Oh, to be a fly on the wall, and see all those people discover your Post-Its, read…and smile. You have warmed many hearts, I am sure. It was a lot of fun to do..
Pingback: 4:23 am and inspired. Climbing the (big) dune… – Lead.Learn.Live.